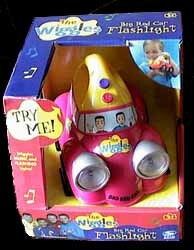 The Wiggles Big Red Car Flashlight is not one of the best Wiggles themed toys. Whilst I acknowledge that it's a clever idea (to have a flashlight that uses a toy car's headlamps to provide the light source) I was a little disappointed to see that more wasn't made of this. There are two buttons. One turns the headlights on and off, whilst the other plays a quick burst of Toot Toot Chugga Chugga Big Red Car or In the Big Red Car We Like to Ride. While the music plays the headlight flash - which is pretty neat. Thankfully the songs are just short enough that they don't become annoying to anyone over the age of 12. But it was this lack of variety which really concerned me. It would have been much better if there had been a few more songs included. This is still a quality toy it's just that, when compared to the other releases in this range, it feels like a half hearted attempt to cash in on the Wiggles brand.